| Why Does Stephen Covey Need An Eighth Habit? 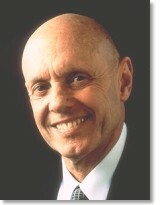 Home > Blog	> Why Does Stephen Covey Need An Eighth Habit? Why Does Stephen Covey Need An Eighth Habit? Steven Covey, the 71 year old motivational speaker and author has found the need for a new habit. You may be saying “Sure, he needs to figure out a way to sell a new book!” Well that may or may not be true, however his first book The 7 Habits of Highly Effective People has sold more than 15 million copies since 1989 and has been translated into more than 35 languages. Fifteen years later Covey has a new book called The 8th Habit. Why do we need to have an 8th habit? Because there has been a fundamental shift and we have moved from an industrial model to a knowledge worker economy. The 8th habit deals with the shift from effectiveness to greatness and is all about finding your own voice and helping others to find theirs. Do you need some new career habits in 2005? One of the key qualities of most successful professionals is their ability to recognize change and their role within change. This is easier said than done. One of my client’s was speaking about the profound impact that this book has had on his thinking and recognizing his own need in doing something of significance. He is quite successful, however, at times his success feels empty. He is on the journey to finding a new chapter to his own voice. Just like Steven Covey, our careers evolve. I want to help you find your voice for two reasons: #1-for you and # 2- for all the other people that your life impacts. They say you can’t teach an old dog new tricks, but I don’t buy that. Stephen Covey struck out from an academic career at age 50, over 22 years ago. Finding your own voice starts with looking. Let me be your guide.